BRAMPTON, Ont. 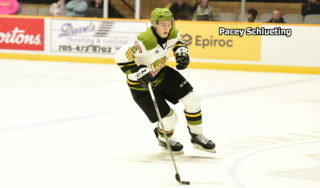 – Blake Clarke scored two goals and added one assist to power the Brampton Battalion to a 4-3 victory Thursday night over the Mississauga Steelheads, giving the Troops a third straight Ontario Hockey League win. Barclay Goodrow had one goal and one assist and Nick Paul the other goal for the Battalion, while goaltender Matej Machovsky contributed 35 saves. 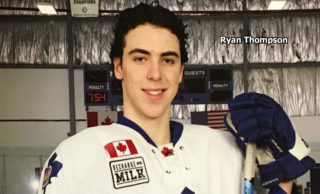 The Troops, who improved their won-lost-extended record to 23-18-8 for 54 points, third in the Central Division, stayed two points behind the second-place Sudbury Wolves, who defeated the host Niagara IceDogs 4-1. 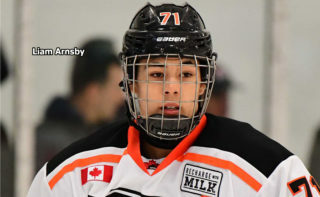 Riley Brace had one goal and one assist and Stuart Percy and Trevor Carrick a goal apiece for Mississauga as goaltender Spencer Martin faced 21 shots. The Steelheads are 22-22-4 for 48 points, fifth in the division. Paul opened the scoring at 3:37 of the first period after feeding Goodrow in the middle of the ice off a two-on-one rush. Goodrow’s backhander was denied by Martin, but Paul lofted the rebound home for his 12th goal of the season. Mississauga’s penalty problems started at 7:59, when Alex Cord went off for charging. Dylan DeMelo and Percy drew interference and unsportsmanlike conduct penalties respectively at 8:38, putting three defencemen in the box. Goodrow capitalized just eight seconds into the first two-man advantage, redirecting a centring pass from Clarke in the right-wing corner. Clarke struck at 9:25, tapping home the puck from the right edge of the crease off a feed from Mike Amadio on the left wing. Dylan Blujus had the second assist. 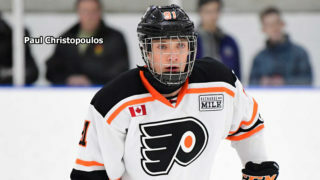 Percy cut the Mississauga deficit to 3-1 at 14:11 of the second period, throwing a backhander toward the net from the right-wing circle and having it fool Machovsky. Clarke replied with what proved to be the winning goal, his 17th, at 15:35, converting off a two-on-one rush with Nicholas Foglia. Foglia carried the puck down the left wing and cut to the slot for an initial shot and rebound attempt before Clarke swatted the rubber behind Martin. Brace scored 2:01 later, crashing the crease and barreling into Machovsky with a defender as the puck found its way into the net. The play went to a quick review, and the call on the ice was upheld. Matt MacLeod fought Mississauga’s Jacob Graves at 13:50 after taking exception to a hit on Jamie Lewis. The pair threw punches while jostling for advantage before being separated by the linesmen. Defenceman Carrick pulled the Steelheads within one when he scored at 17:05 of the third period on a slap shot from the left circle that beat Machovsky low on the glove side. The Battalion scratched Brendan Childerley. 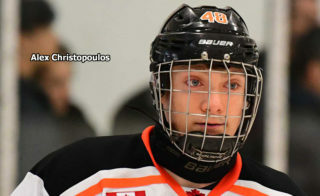 Mississauga scratches were Tyson Teichmann, Eric Diodati, Scott Teskey, Nick Zottl, Lucas Venuto and Andres Kopstals. 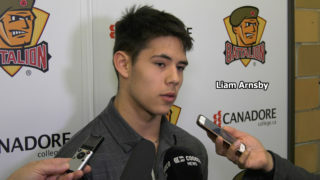 The Battalion visits the London Knights at 7:30 p.m. Friday. The game can be seen live in Brampton on Rogers Cable 10 and in Caledon and Orangeville on Rogers Cable 63. BATTALION NOTEBOOK: Attendance was 1,871 … The Battalion’s only longer winning streak this season was six games Nov. 10-22 … The Troops went 2-for-5 on the power play. Mississauga was 0-for-5 … The Battalion is 15-6-3 at home. Mississauga is 8-14-2 on the road … The Battalion, 2-2-2 against its Peel Region rivals this season, went 4-4-2 in January … Goodrow scored his 26th power-play goal, moving into sole possession of sixth place on the club’s career list ahead of Aaron Van Leusen and Howie Martin … Blujus’s assist was his 39th on the power play, tying Raffi Torres for eighth place in club history … Opening line combinations included Francis Menard centring left winger Paul and right winger Goodrow, Lewis centring left winger Clarke and right winger MacLeod and Patrik Machac pivoting left winger Brandon Robinson and right winger Mathew Santos. Foglia centred left winger Connor Jarvis and right winger Amadio … Jarvis played his 100th OHL game … In six games against the Battalion, Brace has four goals and nine assists for 13 points … MacLeod saw a three-game points streak ended. During the run he had three goals and one assist for four points … Mississauga mascot Sauga paid his first visit to the Powerade Centre. The Battalion granted the Steelheads permission to staff two tables in the concourse to provide information on 2013-14 season tickets as well as distribute two-for-one vouchers for the teams’ Feb. 22 game at Mississauga … Members of the affiliated junior B Brampton Bombers handed out programs and promoted a game Saturday. Battalion season ticketholders get free admission with a non-perishable food item … The referees were Patrick Brown and Kendrick Nicholson.